Man vs. Corporation. It’s a well-worn contemporary addition to the pantheon of literary conflict, from Wayne Campbell and Garth Algar defending their public access Mecca against Noah’s Arcade to Josie McCoy and her hep Pussycats warding off the homogenizing blight of MegaRecords. 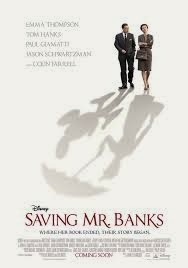 In this tradition, SAVING MR. BANKS, an Oscar-baiting historical drama by director John Lee Hancock (THE BLIND SIDE), pits a lonely, self-made literary dynamo – Marry Poppins author P.L. Travers - against a voracious corporate empire – Walt Disney. The twist? BANKS – a Walt Disney Pictures release - asks us to root for the cultural imperialists. Me, on the other hand… I really liked this flick. Set primarily in the sun-blanched Deco purgatory of '60s Los Angeles, SAVING MR. BANKS tells the story of Walt Disney’s (Tom Hanks) final desperate bid to purchase the screen rights to P.L. Travers’ landmark children’s book. Travers, played with stodgy, schoolmarm aplomb by the great Emma Thompson, arrives in California with a bone-deep aversion to Disney’s vacuous, commercial ubiquity, and a hellbent reluctance to sell her beloved, umbrella-piloting Poppins. As Disney fawns over the writer, promising full script approval and granting her continuous access to the film’s potential writer and songsmiths – Don DaGradi (Bradley Whitford), and Sherman brothers Richard and Robert (Jason Schwartzman and The Office’s B.J. Novak) - Travers reflects on the genesis of Poppins, a character rooted in a tumultuous Australian childhood dominated by a fiercely well-meaning, but perilously alcoholic, father (Colin Farrell). Of course, going into the movie we know how it’s going to turn out, and I’m not going to claim that the film is in any way revolutionary in its path to the ultimate happily ever after. But for a holiday lark that celebrates a jubilant little corner of Disney’s cinematic legacy, there’s plenty to enjoy. The cast is fantastic. Sure, no one gets to play to the peak of their abilities - save, perhaps, for the cringing, tea-nursing Thompson – but everyone inhabits their roles. Paul Giamatti shows up with an uncharacteristic grin as the overly optimistic chauffer charged with shuttling Travers around 1960s Hollywood; Novak, meanwhile, reacts to Travers habitual fun-policing with the perfect mix of awed frustration and a caustic passion for the project; And during the flashbacks, Farrell excels in stumbling ‘round the devastating collapse of the Travers family’s bright-eyed, booze-eaten patriarch. Tom Hanks may be BANKS’ most forgettable player… after all, what is Tom Hanks’ already genteel public persona but the walking incarnation of a sanitized, twinkle-eyed Walt Disney? Disney fans – I surely don’t need to tell you how downright fun it is to see both Disney studios and Disneyland of the 1960s brought to life on screen. Looking back at the cynical disclaimer I offered in the first two paragraphs, I don’t think anything I wrote was untrue. But then, one thing that makes the film so relatable is that everything out of Travers’ mouth echoes the same sentiments that modern critics of Disney intone, and which SAVING MR. BANKS embodies. It is whimsical, dishonest pap from a cultural attention hog that’s bought out the dreams of four generations, and sold them back at a profit. And certainly just as the real Travers allegedly hated Disney’s film, so, too, would she have likely hated this one. Still, that the film manages to openly acknowledge all the jaded, well-argued barbs flung at the Disney empire, and then wipe them away with some dancing penguins and the lilting refrain of “chim-chim-cheroo” is a feat I’d like to believe is at least one part magical. And maybe it isn’t. Maybe taking my well-earned corporate skepticism, coating it in sugar, and charging me one adult admission to temporarily escape a bitterness that Disney’s own cultural overbearance and bald profiteering fostered is a devious trick.